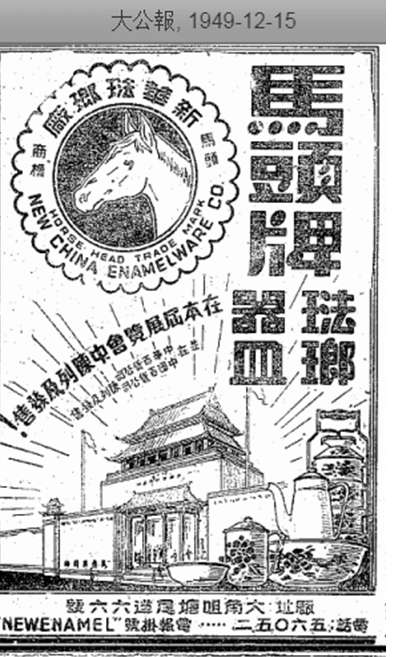 New China Enamelware Co, known for its “Horse Head” brand (馬頭牌) of enamelware, was one of the leading enamelware manufacturers in Hong Kong before its closure in 1970. In fact, it ranked number two behind I-Feng Enameling at one point and was also the first enamelware factory to relocate from Shanghai to Hong Kong (as I-Feng was a branch rather than a relocation). The original New China in Shanghai was founded in September 1946 by L.C. Chang (張陵洲) and T.C. Shen (沈東橋) at 316 Xujiahui Road in Shanghai. Chang was the brother of Y.C. Chang (張禹洲, 1903-1972), a prominent figure in the Western pharmaceutical business in Republican China who started his career atKofa American Drug Co, the leading foreign owned drug company in Shanghai which started out as German owned Voelkel& Schroeder in 1866 and became American owned in 1919. Y.C. 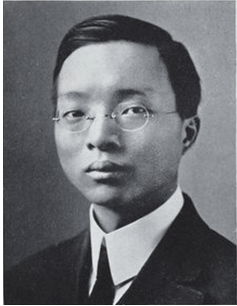 Chang worked at Kofa from 1922-29, during which he foundedHaipu Pharmaceuticals (海普化學製藥廠, now Shanghai XudongHaipu Pharmaceutical Co Ltd), the first and largest manufacturer of injection drugs in China in 1925. In 1929, YC quit Kofa to focus on Haipiand also formed Murray Drug Co (美利西藥行) to import raw materials for drug production and medical supplies. He installed Suzhou native Jas-Sung Chia (賈瑞生,1908-1992), who later became chairman of New China Enamelware in HK, as manager of Murray.When the Japanese attacked Shanghai in 1938, production in Shanghai was disrupted and Haipu relocated to Hankow and other cities. By 1941 however, production resumed in Shanghai where Haipu was producing 159 types of products, including ampoule in partnership with a local glass manufacturer (previously relied on imports) and raw materials. After the War, the Chang family expanded into enamelware with the establishment of New China. As the Civil War situation in China deteriorated, New China started moving its factory in late 1947. 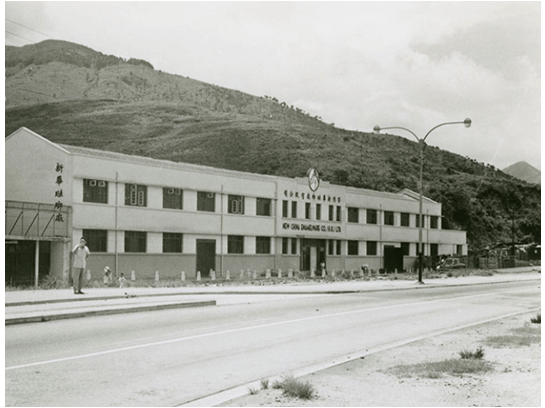 After six months of preparation, the HK factory opened at 66 Tong Mi Road in Tai KokTsui in May 1948 with J.S. Chia as chairman, LC Chang as manager and C. Y. Chao (曹宗源) as sales manager. The factory started with 3 kilns and 120 workers, most of whom came from Shanghai. The firm was producing 4000 face washing bowls and 1000 dozens soup bowls and plates per day, mostly shipping to Southeast Asia with minority being exported to markets such as Africa and Australia. Although business was booming so much so that they needed to find additional workspace nearby, the environment for the industry was difficult as prices were dropping 40% year over year thanks to domestic and Japanese competition while costs remained high as enamelware manufacturers relied on imports such as metal from the United States and chemical from the British firm ICI. Within six months, the Tai KokTsui plant expanded to 6 kilns and ranout of capacity. A bigger plant was built on a 120,000 sqft site in Tsuen Wan with new machinery imported from the US that had three times the productivity of the old one. Two months after Haipu’s factory in Xujiahui was bombed by KMT bombers in February 1950, Y.C. Chang arrived in HK to join his brother where he served as director of New China. In January 1956, Governor Grantham visited New China plant in Tsuen Wan (he also visited South Sea Textiles on the same day) where he was greeted by L.C. Chang and his team. By that time, New China had 450 workers and its exports to Southeast Asian countries such as Thailand and the Philippines exceeded $8 million. The most famous director of New China who also served as its secretary and represented the firm as chairman of the industry trade group HK Enamelware Manufacturers Association (LC Chang was vice chairman at one point) was Chow Hou-Kun (周厚坤), also known as the “Father of the Chinese Typewriter”. Graduated from MIT as one of its first MSc in aeronautic engineering graduates in 1915, Chow worked as an engineer for Curtiss Aerospace in the US, the Commercial Press (where he invented the first Chinese typewriter), Mobil Oil and China Merchants in Shanghai before moving to HK where he consulted the CMA in starting an industrial school in addition to working for New China. In 1959, Chow was appointed to a 15 member committee responsible for the establishment of the Federation of HK Industries which included other prominent industrialists such as the preserved ginger king U Tat-chee, Sze-yuen Chung of Sonca, Haking Wong of Halina cameras, H.C. Ting of Kader, Linden Johnson of Mandarin Textiles, C.C. Lee of Textile Alliance, Mou Lee, Daniel Lam See-hin of Chiaphua, Paul Lau of Camelpaint and others such as Fung Hon-chu from Li & Fung, representatives from Jardine and Swire. (Sik-Nin Chau and Douglas Clague served as chairman and vice chairman). Chow later moved to the United States but his date of death is not known. In October 10, 1970, the owners of New China decided to close its factory despite long periods of profitability and over 100 workers lost their jobs. After 9 rounds of negotiations, a settlement was reached in terms of severance. As a firm, New China Enamelware Co (HK) Ltd was incorporated in March 1949 and dissolved in November 1999. Like many of his fellow Shanghainese enamelware manufacturers in HK, New China chairman J.S. Chia shifted his focus to his primary export market – Western Africa where he established Continental Iron &Steel (CISCO) in Nigeria in 1967 and served as its chairman. By 1978, the firm’s shareholders included Japanese (Kyoei Steel and Nissho Iwai, 35%) and Nigerian interests (40%) while the Chinese investors led by Chia retained 25% interest. J.S.’s son S.K. Chia (賈士群) served as general manager of CISCO and is married to a member of the Tung family of I-Feng Enameling. This article was first posted on 3rd August 2018.